But not all Dads are the same and the little girl in the story is searching for her dad. She can see a 'dashing dad' and a 'crashing dad', a 'creeping dad' and a 'sleeping dad', but where is her dad? And what is he doing? Beautiful rhythm makes this a joy to read aloud and the rhyme is never awkward. All the activities that Dads partake in set up fun conversation starters for young children and their readers - What does your Dad do? What makes him special/different? The colourful soft illustrations depict the playfulness of this story, showing lovely characters. We see Dad's in all sorts of situations, each having a wonderful time with their children. 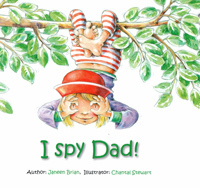 I Spy Dad is full of fun for three to six year olds and with Father's Day is coming up it is the perfect time to celebrate the happy bond between Dads and their children.